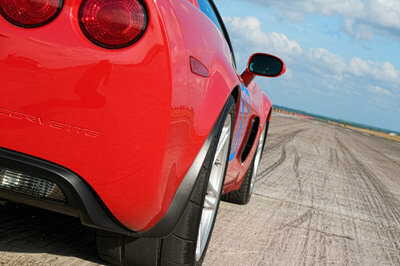 Goliad, Texas – this town is home to one of the purest motorsport events of the year and it’s called the Texas Mile. People from all over the country travel to this location for three days of gasoline fume induced chaos on an abandoned air strip. Nothing makes for a better all-out speed track than a place where jet-fighters used to take off so the organizers have arranged a sort of extended drag race for any participant who wants to sign up. Since 2003 people have been able to let loose in their motorcycles, trucks, and sports cars on what is essentially a one-mile stretch of open highway. Sure, driving down the historic Route 66 in your classic 1969 Ford Mustang is fun, but being able to put your foot to the floor on a stretch of road where no police officer will do anything about it is the ultimate rush. Last year, the event was packed and this year it has already sold out so you better be ready when registration rolls around for the next one. Cars have been known to go well beyond the 200mph mark and even crash on the ½-mile slow down stretch, but it’s all about how far you want to push yourself. Hit the jump for more details on the Texas-Mile Event. Depending on what type of vehicle you have brought to test at the track you will be placed into certain categories of the like. Three different general categories exist, each with their own set of sub-classifications. Depending on which classification your vehicle initially falls, there is also a set of questions and regulations that must be filled in order for you to race. After that has been done you can sign you and your car’s life away and get ready to race. Beyond setting your own personal records of breaking maybe 120 or 150mph, this event is about breaking actual world records. Some of the people come here to push their vehicles to the limits and sometimes beyond. The event is three-days long, but the final day is when the land speed record attempts take place. This past Fall was the last time the event was held and one gentleman went for the ride of his life. 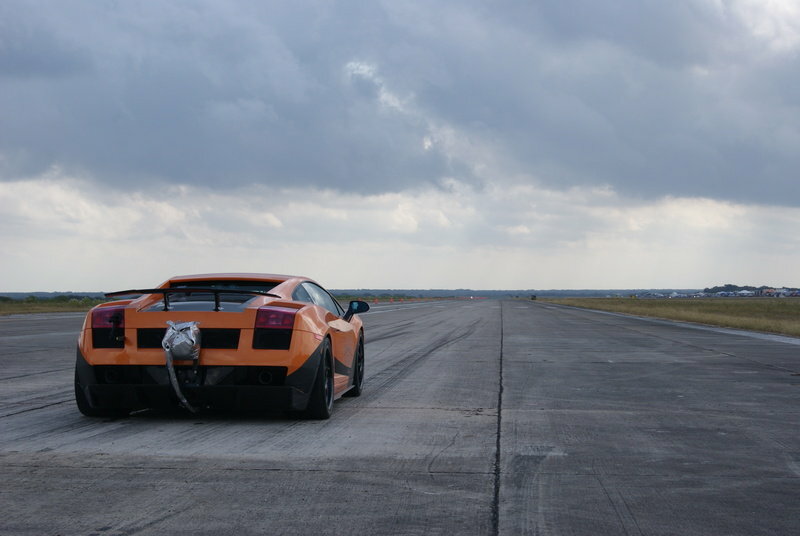 Richard holt is the lucky drive of the Underground Racing Lamborghini Gallardo. He has made various improvements to the car, but the most important may be the roll cage and parachute to help him stop. 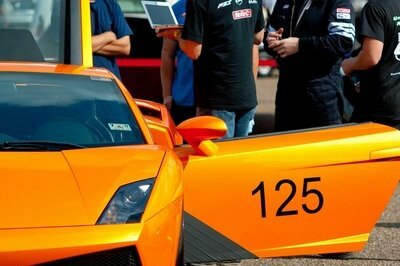 After running his car one year, the event coordinators made him install a roll-cage in his previous Gallardo. He obliged and when he returned the following year for the race, he would only be filled with gratefulness to those same people. While streaking down the runway at over 200mph he pulled the chute out to help the car start to slow down, wind gusts and the immense force from the parachute pulled the Lamborghini off the track and it flipped multiple times. Besides now being a worthless piece of scrap metal, the roll cage undoubtedly saved his life. 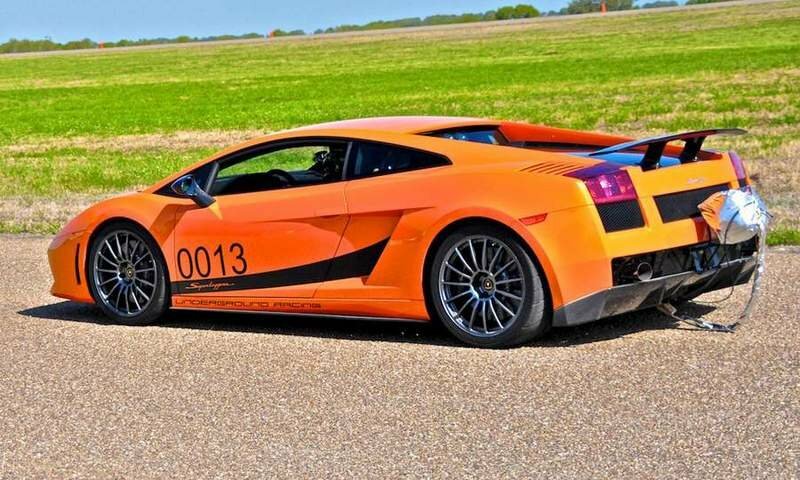 In 2010, Jonah Yokubaitis set a record for high-speed in his #125 Lamborghini Gallardo LP560. By the time he was at the end of the track his car was traveling at 243.0mph. This record was actually eclipsed by another driver in a Gallardo with twin-turbochargers attached to the mighty V10. Richard Holt broke the record at almost the sound barrier at an astonishing 250.1mph in the unlimited street car class. It is easy to see why people come to this event whether it’s to race their own cars or cheer on those with the fastest times. This event in March should be no different and we look forward to bringing you all the results as soon as they come in each night from the track. The first night of racing is March 25, 2011. It’s a great thing they put up this kind of idea. Well, this is going to be exciting for those who want to join and mostly to the viewers who want to see this but be prepared for accidents it may cause. hmm. I think its already given when there’s a car race then definitely its near to crashing incident. The drivers needs to be careful and be sure to wear those seat belts. A few weeks more. I can’t really wait to watch this one again. I am definitely excited to see those NOS powered Lamborghini’s zooming buy. I expect that there would be a lot of crashes again here, considering how some of the drivers can go nuts about speed. Too bad for the cars. Again, this one would be a sure fire hit. I really love seeing Lamborghini drivers letting it loose on the road. And the bike riders are also a great attraction. I’ve been a regular visitor to the event since 2005 (mostly went to the March event). And I have seen how crazy some drivers can really go with the gas pedal when on this road, so it would surely be a delight to watch.